Genre: Comedy/drama with some supernatural elements. Also Recommended: AIR, Kanon, Clannad the movie, Sola. Notes: Based on the visual novel video game by Key. This review does not take into account the one-episode story "Another World: Kyou Chapter", even if it's included in the DVD collection (vol. 2) alongside the other two bonus episodes. Having finally confessed to Nagisa, the future looked a little brighter for Tomoya Okazaki. With school in full swing as well, he wouldn't lack for things to keep himself busy with or new friends whom to involve himself with as well. And from there...? But there are also problems in the horizon, some of which may have grave consequences for everyone involved, and it might take Tomoya holding on to every piece of light he can to get by. 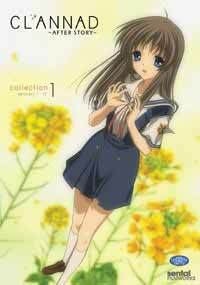 Having seen AIR and Kanon (2006) already, I was fairly optimistic about Clannad keeping up expectations, at least insofar as creating sweet, mysterious -- and even a little bit tragically -- atmospheric situations. Ok, so me and my fellow THEMers went into AIR thinking we had a synchro/MST victim on our hands, but that's beside the point. Now, I can't be talking about ~After Story~ without also referring to the original TV series. Not that this is a problem, mind you; I rather liked that one too. Maybe not quite as well as Kanon; this being one of the few situations where a dub really helped out by de-MOE-ifying the characters in the show. (Which is to say I generally attribute voice acting and/or voices over visual styles when it comes to judging and labelling anyone and anything as "moe". But that's just me.) Also, I was talking about Kanon. Sadly, Clannad's DVD release has no dub, so we'll just have to deal with what we have. The thing about Clannad is that I felt a lot of the characters are like Kanon -- no wonder really -- except that I fell into the pattern of preferring Yuuichi's sardonic and sarcastic wit over Tomoya's prank-related style, or finding the various girls in Kanon generally more interesting than the ones in Clannad. We're not talking huge margins here, but one I still felt was noticeable all the same. Most of those changes can only be felt and not seen, though. (In a more or less metaphorical sense.) One slightly irritating thing about this show is that none of the character go through a lot of changes outwardly, even though years pass by, and this go doubly for the girls. It doesn't hurt the show too much, but it's certainly noticeable. Like Clannad, ~After Story~ comes in two volumes, two discs each. And while the first half plays out the remaining side stories and allows Tomoya and Nagisa to clear those final hurdles into adulthood, the second half will play up the tragedies and the drama considerably, quite possibly tearing out your heart in the process. This is where time truly starts to fly by, lending the show some real weight in the emotional departments. If Tomoya thought he had a lot to deal with before this point, then the latter half will tear him down, allow himself to get back on his feet, only to tear him down again. I hope you got your tissues prepared, because you'll most likely be needing them before the end of this show. Sadly, this also leads to my second and last complaint about this show. Basically, its love for tragedies leads to some far too predictable scenes. As good as this show is, the setup to the bigger tragedies are, unfortunately, as subtle as a policeman or a soldier talking about going back to his family after completing just this one last mission. Scenes of tragedy should NEVER be preceeded with a feeling of seeing where it's going. This is particularly noticeable near the end of the show, judging by the mixed reactions from people who has seen the show to the end. While I personally don't think it was a total disaster -- or even BAD -- it still could have benefitted from a few changes as to make it less obvious. Even so, time spent on Clannad ~After Story~ is well spent. Weighing the negatives -- no dub, occasionally overdone drama -- against the positives -- generally fun cast, some true tearjerking moments, pleasant visuals, the fact that the show dares to look past the highschool years -- makes it a must-see if you're into drama shows, even occasionally hammy ones. And if you've already seen the original Clannad TV series, well... the choice is quite easy. Recommended Audience: Clannad has a surprising amount of serious topics on its roster; alcoholism, drugs, diseases, child abandonment, death and violence. The onscreen portrayals of any of these are rarely shown onscreen, but the consequenses for each of these are quite readily felt by those with enough maturity to understand the situations. Clannad ~After Story~ © 2008 Visual Art's, Key, Kyoto Animation.